1942 left Tranquillity about 8 Oclock came through Santa Maria cant find any place to live got a camp house at Los Alamos. 1943 I guess Daddy is going To stay in L. Beach again tonight its 9:10 & I sure Do miss him. Its Nice here Now. 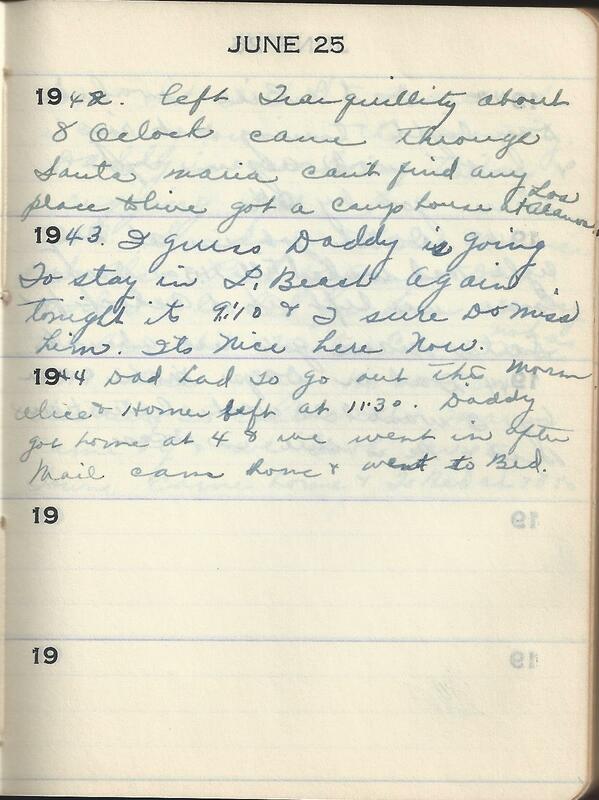 1944 Dad had To go out this morning Alice & Homer left at 11:30. Daddy got home at 4 & we went in after Mail came home & went to Bed. Image | This entry was posted in Tennant, Wright and tagged Family history, genealogy, Long Beach California, Los Alamos California, Martha Marie Tennant, Martha Marie Wright, Martha Marie Wright Tennant, Martha Tennant, Rene Baron, Santa Maria California, Sylvia Rene Stevens, Tranquility California. Bookmark the permalink.